5 Comments on "Why You Should NEVER Sign ‘Refusal To Vaccinate’ Document"
I have wanted to thank you for being honest and trying to protect our children. I vaccinated my first three children, much to my shame. One of my boys almost died and one has autism. I know I can’t go back but I often wonder what life would be like had I been introduced to your work before I vaccinated. Thank you. 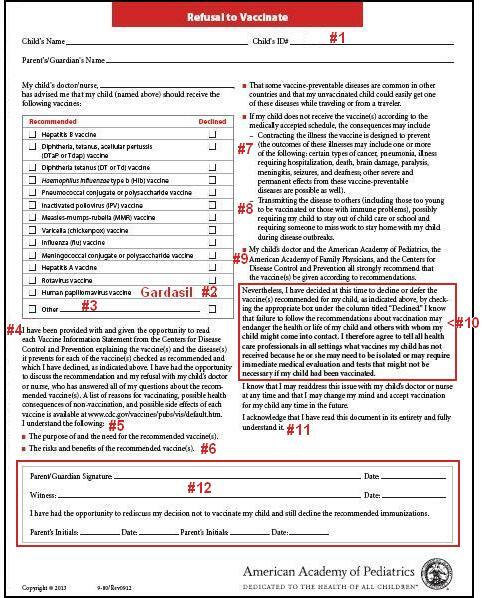 >>> what can a parent do if they have signed it in a rush while their children >>> are just antsy to get out of the Dr’s office!? what can a parent do if they have signed it in a rush while their children are just antsy to get out of the Dr’s office!? Is there a way to destroy the document? Yes. Those are YOUR medical records. You can as for the for back. You can ask to void the current form; if it is a paper, put a red ink line through it and write VOID. You can write a letter to your doctor, rescinding your signature and you are withdrawing consent rendered on the form that you filed.